Research around home destruction vs. home survival in wildfires point to embers and small flames as the main way that the majority of homes ignite in wildfires. Embers are burning pieces of airborne wood and/or vegetation that can be carried more than a mile through the wind can cause spot fires and ignite homes, debris and other objects. There are methods for homeowners to prepare their homes to withstand ember attacks and minimize the likelihood of flames or surface fire touching the home or any attachments. Experiments, models and post-fire studies have shown homes ignite due to the condition of the home and everything around it, up to 200’ from the foundation. This is called the Home Ignition Zone (HIZ). Learn more about how wildfires spread and ignite home in our online course Understanding the Wildfire Threat to Homes. An overview of fire history, fire basics, and how homes burn. 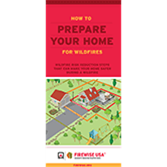 Get some wildfire risk reduction steps that can make your home safer during a wildfire. This fact sheet is also available in Spanish. The concept of the home ignition zone was developed by retired USDA Forest Service fire scientist Jack Cohen in the late 1990s, following some breakthrough experimental research into how homes ignite due to the effects of radiant heat. The HIZ is divided into three zones. *The distances listed for crown spacing are suggested based on NFPA 1144. However, the crown spacing needed to reduce/prevent crown fire potential could be significantly greater due to slope, the species of trees involved and other site specific conditions. 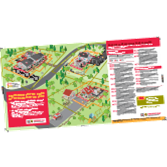 Check with your local forestry professional to get advice on what is appropriate for your property.